Metal nanoclusters, which consist of several to tens of atoms, emit extremely bright fluorescence. So far, we have succeeded in synthesizing fluorescent metal nanoclusters using low cytotoxic metals (platinum) for the first time in the world. As shown in fig. 1, we observed bright blue fluorescence, under 365nm light irradiation. 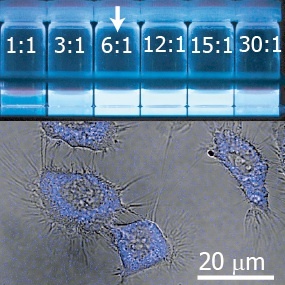 Further investigations showed that these fluorescent metal nanoclusters were not only highly emissive, but also stable and less cytotoxic; hence, they are the excellent fluorescent probe for bioimaging. Also, dependence on quantum size (the number of atoms) allows us to control its fluorescent wavelength. By using several kinds of nanoclusters having different sizes, we can look forward to multi-color imaging in the future. 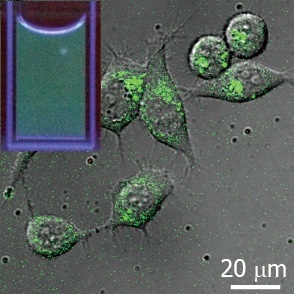 Our research goal is not only to elucidate the emission process of these fluorescent metal nanoclusters, but also to apply these techniques for bioimaging. Fig.1 Nanoclusters composed of 5 Pt atoms. By UV irradiation, nanoclusters emit blue fluorescence. As the nanoclusters are chemically stable and low toxic to bio samples, we are pursuing further applications in cellular imaging. Fig.2 Nanoclusters composed of 8 Pt atoms. By blue light irradiation, nanoclusters emit green fluorescence. By increasing the number of composing atoms, we can make the emission wavelength longer. Real-time measurement of molecular dynamics in living cells allows us to understand a lot of physiological phenomenon. Thus, we have developed a method to observe biomolecular dynamics using localized surface plasmon resonance induced by the interactions of light and free electrons in gold nano particles. When the gap-distance of two gold nano particles (gold nano-dimers) is reduced to nanoscale, the wavelength of scattering light becomes longer. By evaluating the wavelength shift, we can measure gap-distance change between the gold nanoparticles. We are currently developing methods to elucidate biomolecular kinetics. and frequency distributions of the plasmon resonant wavelengths of gold nanodimers with DNA bridges in the presence of SOX2 and both SOX2 and PAX6. By using near-infrared light which is transparent in living cells, we can observe the inside of plants without any damage. This method enables us to clarify functions of plant cells such as alteration in water content under photosynthesis. We strive to establish a non-destructive measurement system especially for water content and photosynthetic products in plants. When light is irradiated to polymers having azobenzene moeities as side chains (azo-polymers), movement of polymers is induced by the photoisomerization of azobenzene. Using this light induced polymer movement, we can create opto-mechanical functions, since light energy can be directly transformed to mechanical energy. Also, these induced deformation pattern is known to be dependent on light intensity distribution and polarization state. By using these characteristics, we can even observe state of both light intensity distribution and polarization state in the vicinity of nanomaterials, which cannot be observed by an optical microscope due to the diffraction limit of light. Fig.4 Polymer deformation induced by a nano light source. and polarization state of the nano light source. 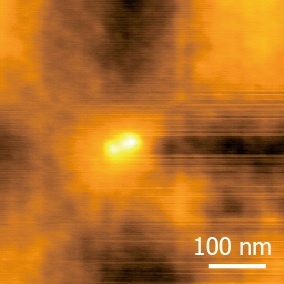 The characteristics (fluorescent lifetime, quantum yield) of fluorescent light emitted by a single molecule near an interface change depending on the molecular orientation. Thus measuring the orientation of single molecules with high accuracy is a crucial technique. Another feature of single fluorescent molecules is repeated cycles of on/off fluorescent emission called "blinking". This behavior is strongly dependent on the molecule's surrounding environment (Oxygen density, viscosity etc.). Therefore, by observing the molecule's "blinking", we can determine its local environments at a nanoscale. Considering the molecular orientation, we can measure an intermolecular distance by FRET with higher accuracy. 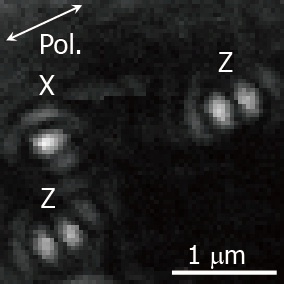 Fig.5 Orientational imaging of single fluorescent molecules.